Desktop and mobile out-of-the-box Coveo .NET Front-End search interfaces include a Filter Summary control that appears at the top of search results to help you easily view and manage facet item selections as well as advanced search page filters (see About Facets and Using the Advanced Search Page in .NET Search Interfaces). Each time you select a facet item, the facet name followed by the selected item(s) appear in the Filter Summary control. From the Filter Summary control, you can clear an individual item selection or all of them at once. The Filter Summary control is particularly useful when a .NET search interface contains a large number of facets. You can quickly view and manage facet item selections without scrolling to each individual facet. 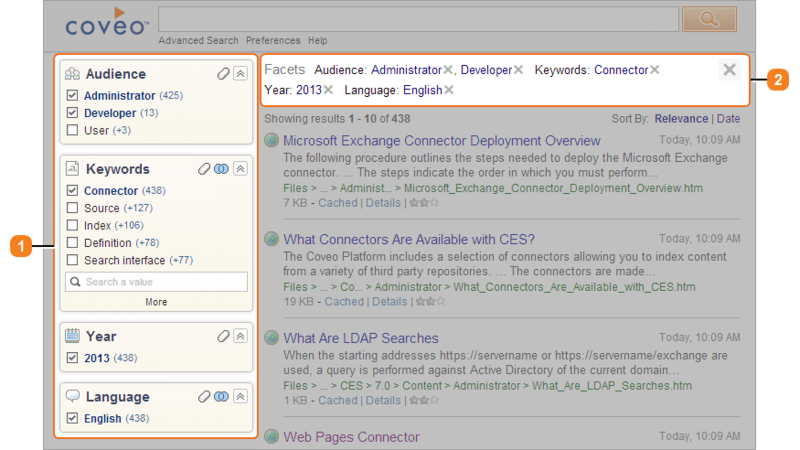 Example: In the following capture, all the facets with selected items (Audience, Keywords, Year, and Language) are visible and replicated in the Filter Summary control. Select one or more facet or Advanced Search page items. In the Filter Summary control that appears at the top of the search results, review the selections to easily identify active filters for your search.